Graham Spencer, Director of S.T. 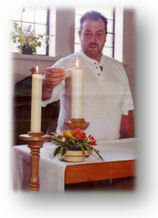 Churchware had been working for a well known company for many years supplying candles and vestments to churches. Along with a colleague at the time Michael Tudor, they noticed a niche in the market and started a part-time business of their own in order to sell Silverware and Brass as well as refurbishing services. The name fell into place 'S' for Spencer and 'T' for Tudor and so S.T. Churchware was born. Churches liked the personal service that a small company could offer and before long the business started to grow, so Michael, who only wanted part-time work decided to leave. It was then that Graham started to consider some of the problems that the Churches were having with candles such as smoke and dripping wax, not to mention the fact that they can be costly. Even though Oil Filled candles were about, they did not look very good. So he started designing and manufacturing a prototype of his own. Today, these have become extremely successful and each one is tailor-made to the customers requirements. S.T. Churchware OIL FILLED CANDLES look like a real wax candle but without the disadvantages. The company is now an established family run business with 15 years experience and has become one of the most trusted companies in this field. We have also added many products to include commissioned and exclusively designed 'one off' wood carvings. We have developed such good relationships with our customers that we have keys to many of the churches so that we can check the stock and deliver what they require in order to save the clergy time and money. 90% of our deliveries are done personally and we will always ensure that if there is no-one to receive goods, they will be left safe and dry. Most of our suppliers are small independant businesses giving us the best quality products. Whatever it is you require, we will do our best to help you get it!